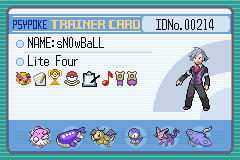 This is tough because I like both Ice and Psychic the same but I voted Sabrina because I hate Lorelei's Lapras. I just really like Lorelei. No particular reason. More powerful than Sabrina, imo. 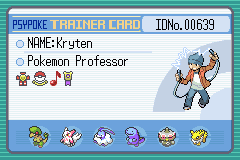 And she uses Water/Ice Pokemon, two types that I like. And she gets involved in the story in FRLG, which is pretty interesting. I agree with sN0w completely. Also, Ice > Psychic IMO. 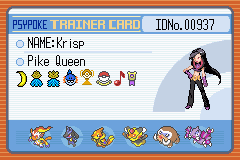 And Sabrina has a stupid Venomoth in her Gym, which isn't even part Psychic! GRR! Lorelei will win.How can evil Sabrina, I mean psycho Sabrina could win this voting match! Goo Lorielei. She is such a better fighter. her water and fighting types are better. w00t i tipped the balance for Sabrina go Sabrina! Sabrina is just awesome.Psychic powers rule.Vote to her.Lorelei is cool too but not as cool as Sabrina. Man why is Lorelei making it so far I hate her,Sabrina could beat here any day go Sabrina. Go, Lance, the dragon trainer!It's a surprised that the first semi-final tied! I wondered how to do next. Lance, I will support you! You are cooler than Flannery and you are an elite! Even though I love Dragon pokemon and I love capes (:P), Lances pokemon arent exactly my favourite dragons. I love fire pokemon ^_^ Nothing wrong with Flannery. What? You would vote against Lance? He has a Cape! Really, all cool people have (Or should have) capes. I mean, they're so cool! I pretty much don't care about the cape. I vote for Lance because of his involvement in the GSC story, and because of the fact that I like Dragon type Pokemon. Flannery has weird hair and trains fire pokies. Dey ar liek der hotist! I like Dragon types much more than Fire types and Lance has one or two of my favourite pokemon. So I vote Lance. go lance he has 3 of my favorites.